The first thing you’ll see in any Vegas or Macau casino is rows of people sitting down at slot machines, mindlessly feeding coins in and spinning the reels. Casinos rely on the sheep-like behaviour of players who just sit down and play without giving much thought to the games they’re playing. Have a glance through the games lists at our recommended casinos and you’ll quickly realise that there are literally thousands of online games to choose from. This only amplifies the difficulty for slots players in discovering which slots are preferential to them and their style of play. However, there are a few ways to identify the difference and allow you to determine the type of game you are playing – and apply the best possible playing strategy. Unlike games such as Blackjack and Baccarat, there’s no real skill involved in playing slots and no gambling ‘system’ that can be employed to increase your chances of winning. Slots are based purely on chance. But there are certain variables that you should be aware of when playing slots, not least when it comes to the game you choose to play. One of those variables – and perhaps the most important in terms of slot selection – is slot variance. Slot variances determine how often and how much a video slot will payout. However, many players are still confused by what low, medium and high variance slots are and how they affect game play and overall payouts, experiences, and bankrolls. Low variance slots provide players with frequent wins, but the wins are small and lack the ability to increase your bankroll substantially. High variance slots, on the other hand, tend to award large wins, but they are less frequent. A Medium variance slot combines the two elements and offers wins that vary in size, meaning you will have a fair number of smaller wins, but the larger wins will also be more frequent, though not at the same level as the life-changing one-off sums you can get with a high-variance slot. Players come in all shapes and sizes – some are patient and happy to wait for the big pay out; others want the thrill of small, frequent wins. Most, I suspect, are somewhere in the middle. Fortunately, online casinos know this and try their best to tailor games to suit all players. Clearly, then, choosing a slot that offers big enough wins to satisfy you and keep you playing – but doesn’t make you wait forever for each win! – will be a big factor in suiting your playing style, and increasing your overall satisfaction when playing online slots. 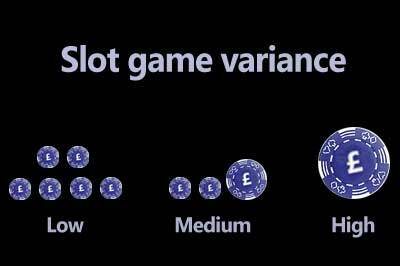 If you’d like to find out more about the about the difference between low, medium and high variance slots, the next three blog posts will focus on each one, to help further your ability to identify the games you have an interest in. Each post explains the basics and provides some valuable information that will save you time and let you focus on playing, rather than investigating each slot you play.